Color-changing hearts light up the snow-filled Bridge Street Bridge in Oswego. 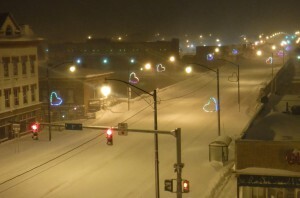 OSWEGO – Ellen Butler Clark, Concierge with Experience Oswego, recently donated illuminated and animated hearts to be placed on the Bridge Street Bridge for the month of February. The color-changing hearts shine through the snowy conditions in Oswego this morning (Feb. 11). The hearts started out red. 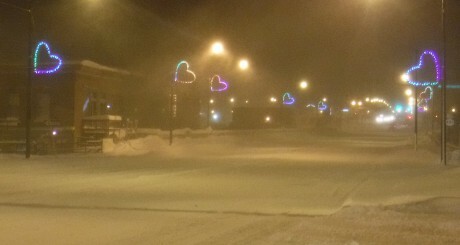 They were changed to a tracing heart of red and are now in full color-changing mode. Other color surprises are still to come!